Now in their sixth year, I’m very pleased to announce the dates for my Herb Walks for 2017. 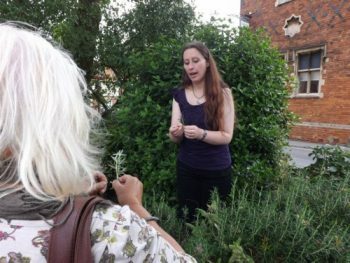 Learning about rosemary (Rosmarinus officinalis) on the Urban Herb Walk – so much more than using in cooking! The walk departs from the Bailgate area of Lincoln (location confirmed on booking). From here, we take a gentle stroll around the Cathedral Quarter. I would recommend that you wear flat, comfortable footwear, and bring a brolly or rain jacket just in case it happens to rain. 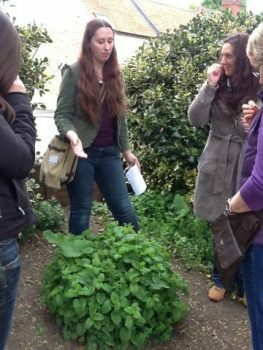 What happens on an Urban Herb Walk? We take a very pleasant and fully interactive stroll of just under 2 hours around uphill Lincoln, looking at the different types of medicinal plants, wild flowers, herbs and trees that grow in the area. One of the great aspects of Lincoln is that there are many open green spaces, and intermingled with the flora and fauna is a surprising number of flowers, herbs, plants and trees that can be used medicinally or within the home for unusual cooking purposes or even first aid. Most of the plants and trees that we look at, feel and smell, you might ordinarily pass by without realising they have a use, or you might consider them as weeds. By actively encourage people who come on each walk to really interact with plant-life, it really make the subject come alive and helps you to identify plants in the field for yourself, as this is an art and very useful skill that is gradually being lost by humankind as the years pass by. Some of the plants I introduce on the walk also have rather quirky history attached to them, which is fun to share too, but also interesting to consider in its origin. And by remembering these ancient stories, it helps us to remember what each plant can be used for. A colourful e-handout (or printed handout for those without internet access) of the herbs that we learn about during each walk is available for everyone within a day of the walk, which has plenty of tips and suggestions about how they can be used in the home. It would be great if you could join me, so why not contact me to book on today. Places are filling up fast already!